Arc System Works' Daisuke Ishiwatari thinks he has the answer to western dominance of the games market: Japanese culture. Japanese developers have been largely left by the wayside this console generation. Rising development costs, along with the rapidly growing popularity of traditionally western genres are causing more and more Japanese developers to start emulating western companies rather than vice versa. In an interview with Gamasutra, Guilty Gear creator, Daisuke Ishiwatari, explained why he doesn't think that's the way forward. "Games developed overseas have progressed massively in terms of technical skill, and I don't think there's any way that Japan can win in that battle," he said. "So I think it'd be nice if we can approach the world market in a Japanese kind of way." Arc System Works' is known mainly for its 2D fighting games, one of the few genres still dominated by Japanese developers. "If we don't try new things and evolve, we'll be left behind," he said. "Arc can't make FPSes or RTSes, but I want it such that the fighters we make can't be duplicated by overseas developers." 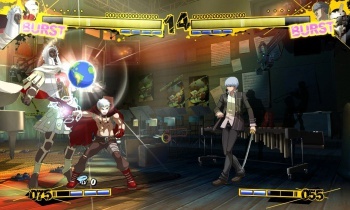 Arc System Works' Guily Gear, Blazblue and the upcoming Persona: The Ultimate in Mayonaka Arena all have a uniquely Japanese aesthetic. "The way we use Japanese culture is one of our primary weapons," added Ishiwatari. When asked about Skullgirls, an upcoming western-developed fighting game that takes more than a little inspiration from Guilty Gear, Ishiwatari's response seemed both enthusiastic and dismissive. "I like that look a lot. I met the makers before, and while the game system is what it is, the design and characters are something I really like," he said. "The control response is a lot like what you see in Japanese games, but the fine-tuning and balancing isn't really there yet." "So seeing a game like this being developed overseas is something that excites and even worries me a little," he continued. "We need to make games that won't leave us left behind in the business, I think."